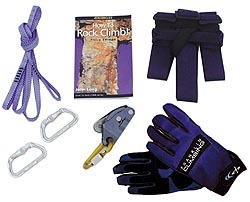 Everything a belayer needs to go climbing with an experienced friend. Parents, this kit will allow you to learn the basics and have fun top rope belaying your son or daughter. Add a pair of shoes and you're set to climb too! Got experience but need to recruit partners? Pick up this kit and teach a new acquaintance "the ropes".